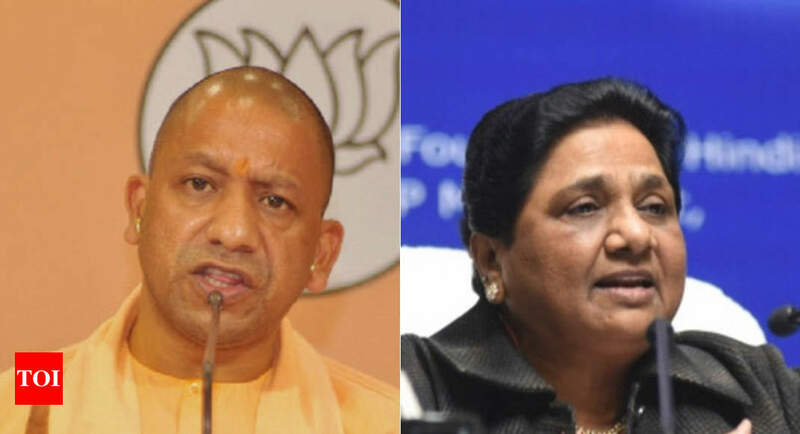 New Delhi: The Election Commission on Monday “censured” UP chief minister Yogi Adityanath & BSP chief Mayawati for their communal remarks during campaigning and barred them from holding any public meetings, road shows, giving interviews and public utterances in media including social media, for 72 hours and 48 hours respectively. The period of their debarment — which as per EC order prohibits them from holding any public meetings, public processions, public rallies, road shows and interviews and public utterances in media (electronic, print, social media) etc in connection with ongoing elections - starts at 6 am on Tuesday (April 16). This means that while Yogi has to stay away from campaigning till 6 am on April 19, Mayawati can resume campaign after 6 am on April 18. Effectively, the two leaders cannot campaign in constituencies covered in the second phase of polling due on April 18, after 10 pm on Monday. EC in its order on Monday said that it “strongly condemns” Yogi for his “green virus” and “Ali-Bajrangbali" remarks during election campaign in Meerut on April 9 and “censures” him for the “misconduct”. Similarly, EC “strongly condemned” and "censured" Mayawati for her "highly provocative speech" on April 7 at Deoband, Saharanpur, saying that the tone and tenor of her references to Muslims stood to aggravate existing differences between religious communities. EC, in its separate orders on model code violations by Yogi and Mayawati, observed that being senior leaders, they should have desisted from "making statements that have the undertone and propensity to polarise the elections, which is not confined to the constituency only where the statement is made, but to other parts as well, due to fast dissemination of information in this digital age". Using its powers under under Article 324 of Constitution and other enabling laws, EC barred Yogi and Mayawati from all kinds of campaigning for 72 hours and 48 hours respectively. The punishment for Yogi was higher as this is the second time he has been found guilty by EC for having violated the model code of conduct. EC has earlier let him off with advice to be more careful with his public utterances in the future. This is not the first time that EC has barred top political leaders and star campaigners from campaigning. BJP president Amit Shah and SP leader Azam Khan were banned from holding public meetings and rallies in UP during last Lok Sabha poll. BJP leader Giriraj Singh was also barred from campaigning in Bihar and Jharkhand.